Developed by two of the leaders in the field, Defending and Preventing Employment Litigation provides expert insight on preventing, preparing for and managing employment litigation in one single volume. Written by Gerald S. Hartman, Esq., and Gregory W. Homer, Esq., this manual can help you prevent and - if necessary - prepare for and manage costly and potentially disastrous employee lawsuits. FREE companion CD featuring full text of federal and state legislation and regulations. Defending and Preventing Employment Litigation can help you better understand and manage every phase of the litigation life-cycle - from the initial employee complaint through the final resolution of the case. 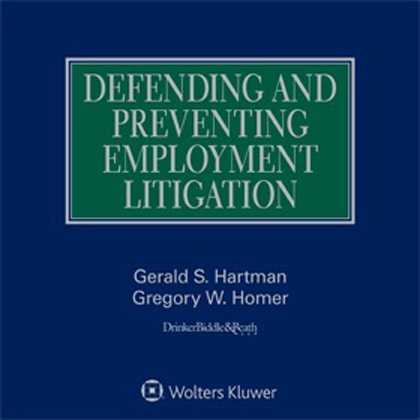 With Defending and Preventing Employment Litigation on your bookshelf, you'll have instant access to vital commentary and citations in the areas that concern you most, including how to defend against harassment, age discrimination and disability discrimination claims; how to avoid charges of retaliation; FMLA compliance; avoiding liability for wrongful discharge and related state law claims; and much more. What Constitutes Actionable Sexual Harassment?